Muslim cleric Abu Hamza al-Masri, held last week on suspicion of being involved in terror offences, has been de-arrested, Scotland Yard said. He had been arrested on Thursday at Belmarsh Prison, south-east London, where he is already fighting extradition to the US. Police had been granted a warrant to question him until 2 September. He was held on suspicion of commissioning, preparing or instigating terrorist acts in the UK. British police had earlier said his arrest on Thursday was not related to the accusations in the US. He was banned from preaching at Finsbury Park, north London, last year but he continued to address his supporters from the pavement. The US authorities want Mr Abu Hamza to face 11 charges, include giving advice to those involved in a Yemen kidnapping in which three Britons died in 1989. Other allegations include attempting to set up a terrorist training camp in the north-western state of Oregon and sending someone to Afghanistan to fight for the Taleban. 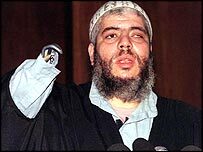 But Mr Abu Hamza's legal team say he will not get a fair hearing if he is extradited to the US.